Recently opened in Sunbury-On-Thames, Homeplay's new Experience Centre helps to show off the best of the best when it comes to home control and automation. Stunning visuals along with a mixture of both standard and bespoke Future Automation products allows customers to get a taste of what's possible in the modern smart home. 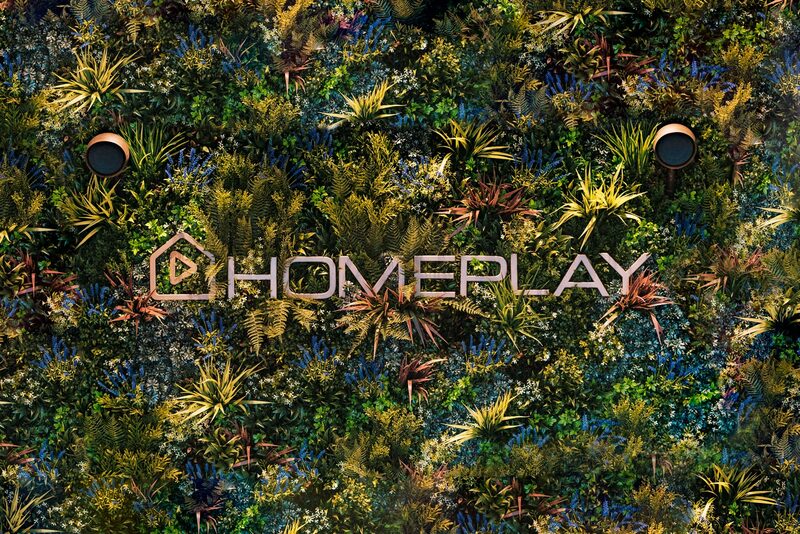 Upon entering you're met with the beautiful "Vertical Garden", designed to not only draw in clients with its interesting aesthetics but also showcase Homeplay's branding, as well as their ability to offer customers smart outdoor audio solutions. Automation inside the new Experience Centre is handled via Control4 touch panels and remotes, while lighting and shade control is enabled by Lutron. 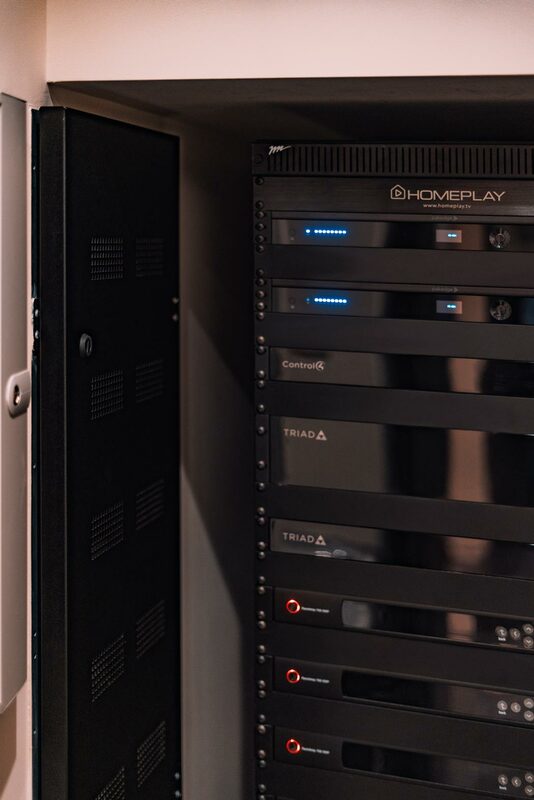 The brains of the new centre are discreetly stored inside a neatly appointed double width AV rack, while the Lutron lighting system is housed inside one of our Future Automation Recess Mount Slimline DIN Rail Enclosures. Our recess mounted DIN rail enclosures are a smart space saving idea for limited space plant or control rooms and thanks to their hinged, vented doors, they are fully amendment 3 compatible. Like all our DIN Rail Enclosures, they are also available Pre-Wired or "Site Ready" as part of our Enclosure Wiring Service. Design to showcase both residential and commercial solutions, Homeplay's Experience Centre features a meeting desk and conference system, combined with a Future Automation PL TV Lift cleverly concealed inside the window sill. Operated over RS232 via the Control4 system, the PL TV Lift's operation is synchronised with the rooms shading solution, allowing complete room transformation from a single button press. See our spotlight video on this PL TV Lift below to see the transformation for yourself and experience the look of it's unique "Drop and Roll Flap". 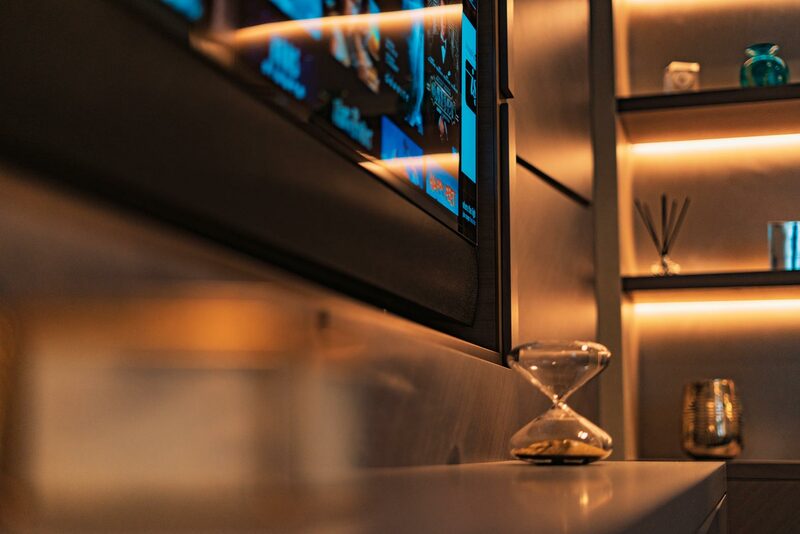 To help reinforce the idea of multi-use spaces, Homeplay's Experience Centre features a social bar area complete with mirror TV and hidden refrigeration. This is located next to their fully Dolby Atmos enabled home cinema room, with the two areas being divided by a bespoke sized Future Automation MDM-SPLIT Moving Door Mechanism. Installing one of our Moving Door Mechanisms gives the team at Homeplay the option to either close off the home cinema room to demo it's full audio and visual potential, or open the room up to allow customers in the bar area to also view the cinema screen, creating a great communal space for entertaining. See our spotlight video on this MDM-SPLIT Moving Door Mechanism below to see how our room diving solutions can help create multi-functional spaces. 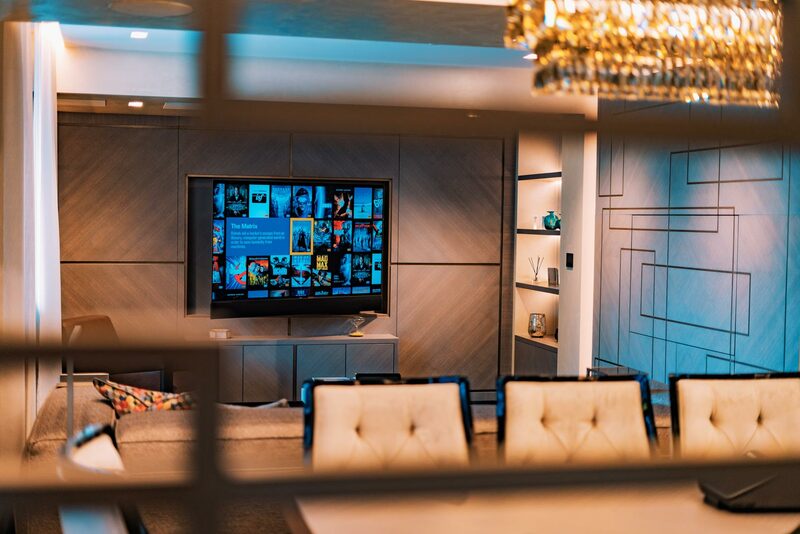 The Experience Centre also includes a Media Room, featuring a 65" recessed screen and width matched sound bar, both mounted on a Future Automation PS55 Articulated TV Wall Mount. The PS55 Wall Mount has been recess-mounting using our compatible Future Automation WB26 In-Wall Mounting Box. 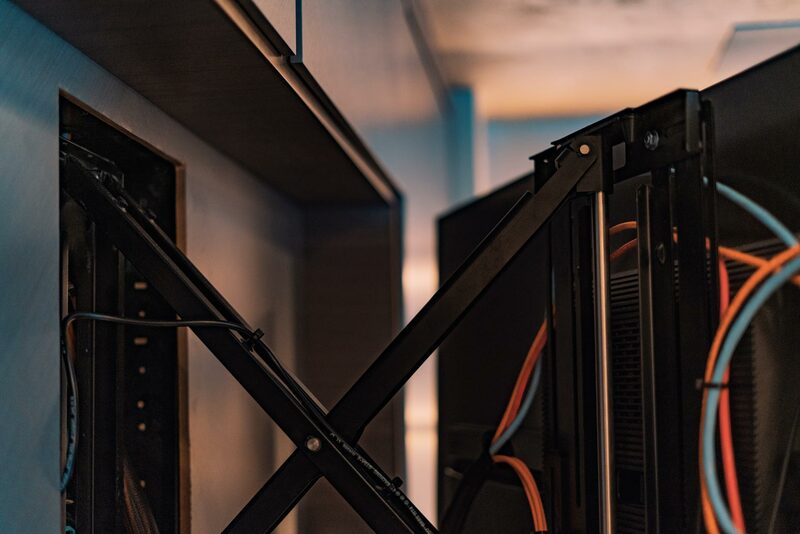 Use of our WB26 In-Wall Mounting Box means that power and source connections for the screen are stored inside the behind the screen, making fitting and future maintenance easy. By recessing PS55 Bracket inside the wall box, Homeplay has also ensured that both screen and soundbar fit flush with the surrounding joinery, giving the illusion of a flat mounted screen, while still having the ability to pull and turn the screen for better viewing. 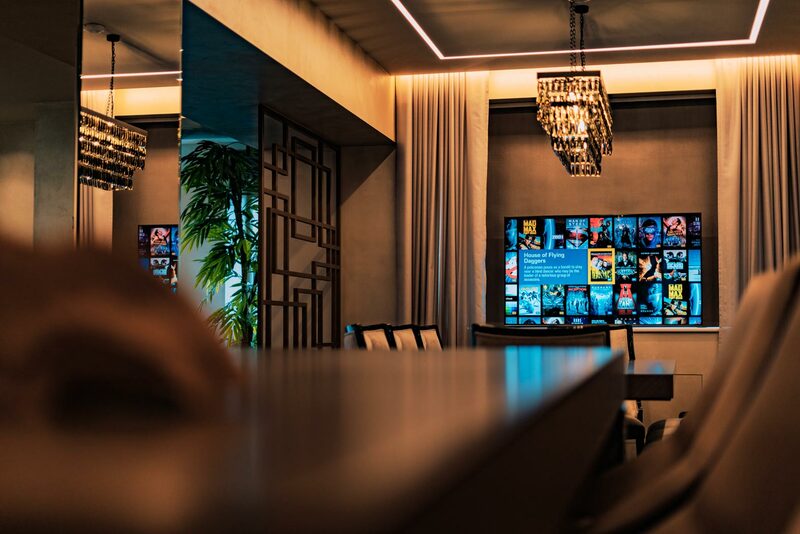 Thanks to the super rigid constructions of our PS55 Bracket, the screen has been mounted in a recess with a minimal gap around, giving a clean and professional finish that fits in the stunning joinery already present in the Media Room. With no vertical or horizontal play when moving, the PS55 allows the screen to be pulled out and turned up to 50° left or right, while still remaining perfectly level. The Media Room also contains a hidden gem in the form of a 55" display, concealed by a Future Automation SPS Sliding Panel System. Almost invisible thanks to the clever joinery design around the sliding panel, the display is smoothly and quietly revealed as the joinery panel drops back into the wall cavity and lifts up before the screen is pushed flush with the surrounding panels. As with the other Future Automation mechanisms in the Experience Centre, the SPS Sliding Panel System is seamlessly integrated into the Control4 system, enabling it to work perfectly with the rest of the technology on display. See our spotlight video on this SPS Sliding Panel System below to see how displays can be easily concealed to stop technology impacting the look of a space. Thanks to James and the team at Homeplay Ltd for giving us access to their amazing Experience Centre, we look forward to working with them on more great projects to come. Homeplay Ltd are an approved Future Automation dealer based in London, UK. They are experts in beautiful home technology. Simple stylish systems, seamlessly integrated into the fabric of your home. Homeplay Ltd can be contacted via www.Homeplay.tv or on +44 (0)1932 781327. If you are a Future Automation dealer or installer and would like to feature your company in a Dealer Spotlight, or if you have a specific project you would like to feature in one of our Case Studies, please contact a member of the Future Automation Team.